I use a Kreg jig for all sorts of things. However when it comes to making drawers out of 1/2 ” plywood or resawing lumber I jus cannot seem to get good solid joints. I follow the instruction Any suggestions ? You have to be careful in plywood or thin wood. It may just be lack of screw purchase? I’m not a big fan of pocket hole “joinery” if that’s what you want to call it. Lots of guys use them for all kinds of things, but they are not a substitute for joinery in all cases. My advice is use another type of joinery for drawers you don’t want those holes showing anyway. drawer and it’s much stronger. I made some quick shop drawers with pocket holes to see how well it would work. I drilled the pockets in back and front of drawers so opening/closing was putting shear stress on screws not on threads. Front screws covered with false front so never seen. Rear screws will only be seen if drawer is removed. 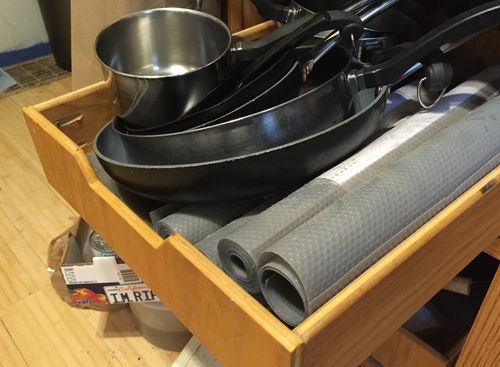 I like that idea – what material did you use for the shop drawers? It was 1/2” birch plywood. I use dado’s. Typically half-dadoes for drawer boxes. Really strong and not too complicated. The drawer lock joint that Troy shows is as simple as it gets, try using it once and you may switch. BTW, I am a fan of pocket holes…just not in this application. I’m all for the drawer lock joint or half blind dovetails. Pocket holes? Yeah, not so much for just about anything. I’ve used them maybe a half dozen times. I’ve used pocket holes on drawers. Very solid drawers in kitchen island have been holding up for years, but those are all made out of 3/4” plywood—they’re large and hold a lot of weight. I like pocket holes for built-in cabinet boxes, where you can never see them. That’s about it for me. I’ve made many cabinet drawers. I use a simple rabbet joint. Glue only no fasteners. I use either 1/4” masonite for the bottom or 1/2” ply if is a large drawer or tray for cookware. The drawer bottoms fit in a dado, cut into the drawer sides. When all done, I flip the drawer over and run a bead of glue around the drawer bottom into the dado. I’ve never had one fail. They stay square and true. The corner clamping jigs from Rockler work very well. To follow up, I discovered in looking back that the pull out shelves on the island are made with 1/2” plywood, hold a tremendous amount of weight, and have held up well. I don’t use pocket holes in fine furniture, but I have no problem doing it in this kind of application. I use the Kreg right angle clamp to get it clamped as carefully as possible. I am about to use pocket hole screws to build a face frame for a bookcase. The red oak is 3/4” thick and I’m hoping this works out well. The screws will be on the back of the face frame and then I’ll attach the assembled face to a bookcase carcass. “First” always make me a bit nervous. Just a comment regarding “The corner clamping jigs from Rockler work very well.”- When I first moved into the new shop, I made clamping cauls that were 30” long, Clamp stands for gluing with slots for f-style bar clamps alternating with slots for pipe clamps, and corner glue blocks. 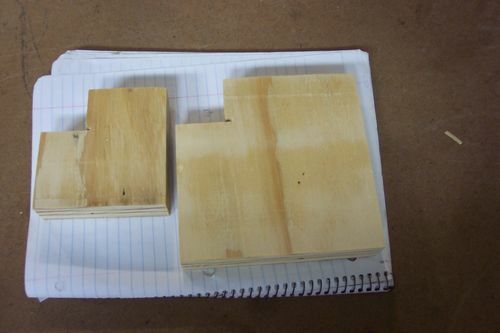 The 90-degree glue blocks are made from 1.5 inch sturdy-floor and are simply a very thick (nominal 1.5” actually measures 1.25”) plywood. I made a couple sets of four each of both 6 in. and 3 in. blocks. 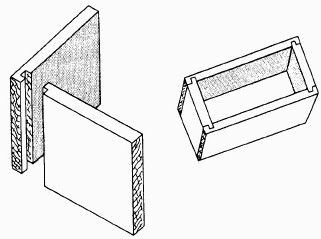 These corner blocks are exactly square and have a square notch cut out of one corner that accepts the head of f-style bar clamps. I used these on a recent bookcase glue-up and they came in very handy. If I make any projects larger than this bookcase (6.5 X 7.0 ft) I’ll probably glue together some 3/4” plywood and cut some 9” glue blocks at 1.5” thick. I’m a fan of pocket hole joining as well but for 1/2” drawer material I wouldn’t think it sturdy enough, but as proven it can be. I use dado s. Typically half-dadoes for drawer boxes. Really strong and not too complicated.